Kauai has some great farmers markets through out the island. They are all local growers who sell the crops they raised in their green houses or small farms. The best thing about them is that most of the fruits sold are organic and always in season. A lot of what is sold was picked that morning and is meant to be eaten within a couple of days. Emilia had a frozen chocolate covered apple banana. It tasted really good in the heat of the day. 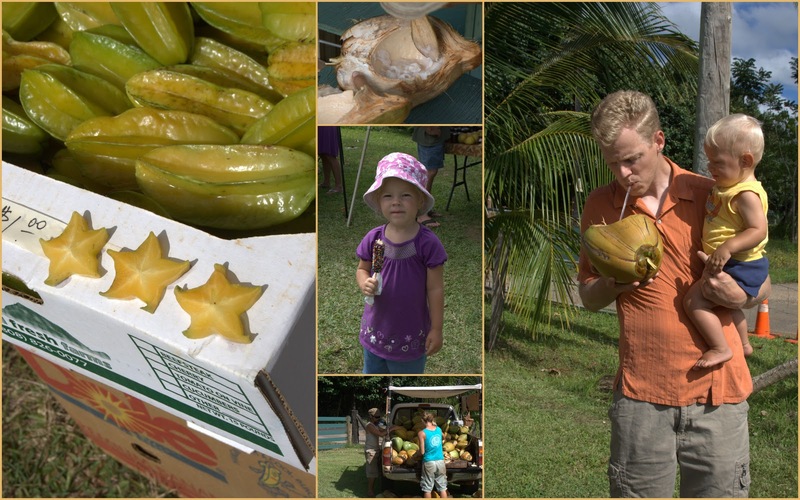 We sampled some of the plethora of fruits for sale: starfruit, dragon fruit, mango, avocados, guava, longan and of course, pineapple. Longan is one of my new favorite fruits. The name means 'dragon eye' in Chinese because the fruit when shelled resembles an eyeball with the black seed showing through the translucent fruit like a pupil. The texture and appearance are similar of those of a peeled green grape. It's very sweet and juicy. Yum! Another new discovery are white pineapples. When we got to the market - only 30 minutes after it has started- they had already sold out. They are sweeter than yellow pineapples and tender all of the way to the center. Did you know that pineapples don't grow on trees? For the longest time I thought they were similar to bananas and coconuts. They actually grow on plants low to the ground. The mangoes were some of the best I've had. I love when they are so ripe that they are no longer stringy on the inside. We also tried some fresh coconut they were selling from the back of a truck. A girl with a machete cut a slit open on the top of the fruit so we could drink the coconut water. Afterward she cut the fruit completely open so we could eat the meat inside. The coconut we had was still pretty green meaning it had a lot of water and the meat was the consistency of jello. Not the best coconut I've ever had. Carson really liked it.